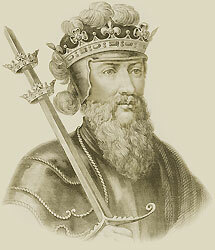 The fifty year reign of King Edward III began when his father, Edward II of England, was deposed on 25 January 1327. For about three years Queen Isabella and her lover, Roger Mortimer ruled England but as soon as her son, King Edward III., was crowned he kept the queen incarcerated for the rest of her life and executed Roger Mortimer. King Edward I married Phillipa of Hainault (now part of Belgium). Edward had a claim to the French throne and called himself King of France and England. This began a war which lasted for one hundred years. King Edward III and his eldest son, Edward Prince of Wales (the Black Prince) gained a very great victory at Crecy. Edward besieged Calais, the town just opposite to Dover. The inhabitants were very brave, and held out for a long time. Whilst King Edward was absent, the Scots under David, the son of Robert Bruce, came over the Border, and began to burn and plunder in Northumberland. However, Queen Phillipa did not send for her husband, but called an army together, and the Scots were so well beaten at Neville's Cross, that their king, David himself, was obliged to give himself up to an English squire. The man would not let the queen have his prisoner, but rode day and night to Dover, and then crossed to Calais to tell the king, who bade him put King David into Queen Philippa's keeping. She came herself to the camp, just as the brave men of Calais had been starved out; and Edward had said he would only consent not to burn the town down, if six of the chief townsmen would bring him the keys of the gates, kneeling, with sackcloth on, and halters round their necks, ready to be hung. Queen Philippa wept when she saw them, and begged that they might be spared; and when the king granted them to her she had them led away, and gave each a good dinner and a fresh suit of clothes. The king, however, turned all the French people out of Calais, and filled it with English, and it remained an English town for more than 200 years. King Philip VI. of France died, and his son John became king, while still the war went on. The Black Prince and John had a terrible battle at a place called Poitiers, and the English gained another victory. King John and one of his sons were made prisoners, but when they were brought to the tent where the Black Prince was to sup, he made them sit down at the table before him, and waited on them as if they had been his guests instead of his prisoners. He did all he could to prevent captivity being a pain to them; and when he brought them to London, he gave John a tall white horse to ride, and only rode a small pony himself by his side. There were two kings prisoners in the Tower of London, and they were treated as if they were visitors and friends. John was allowed to go home, provided he would pay a ransom by degrees, as he could get the money together; and, in the meantime, his two elder sons were to be kept at Calais in his stead. But they would not stay at Calais, and King John could not obtain the sum for his ransom; so, rather than cheat King Edward, he went back to his prison in England again. King Edward, was now too old and feeble to attend to the affairs of the country. Queen Philippa was dead too, and as no one took proper care of the poor old king, he fell into the hands of bad servants, who made themselves rich and neglected him. When, at length, he lay dying, they stole the ring off his finger before he had breathed his last, and left him all alone, with the doors open, till a priest came by, and stayed and prayed by him till his last moment. He had reigned exactly fifty years. Edward, the Black Prince, the eldest son of King Edward III of England and Philippa of Hainault never ruled as king, pre-deceasing his father by one year. The Black Prince was father to King Richard II of England who succeeded King Edward III at the age of just eleven years old. Interesting facts and information with a short biography about the Medieval Life, Times and history of King Edward III. Additional useful details, facts, history, biography, timeline and information about the lives of all of the Medieval Kings of England and the important events which occurred during their times, can be accessed via the Medieval Life and Times Sitemap. The content of this article on Medieval life and times provides free educational details, facts and information for reference and research for schools, colleges and homework for history courses and history coursework.